Henna for Natural Hair- Let's Review! Henna is a plant that grows in the hot, dry climates of the Eastern hemisphere. 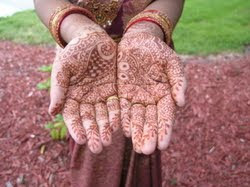 For decades, women from North Africa, India, and the Middle East have used henna to stain their hair, skin, and nails. The red henna dye is contained within the leaves of the plant. After the plant is harvested, the leaves are dried, ground and sifted into a flour-like powder. In the last few years, henna has become a popular treatment option for African American women seeking more natural remedies for their hair. Here are the most frequently asked questions. Is henna safer than commercial hair dye? Yes, but it's very important that you only use 100% pure henna. Low-quality henna mixtures may contain additives like PPD to make the dye stain stronger and darker. Dye additives may cause allergy problems or react with chemicals that have been previously applied to your hair. Unfortunately, the FDA has approved henna for use as a hair dye, but does not regulate its safety. So, the seller of the henna is the only person who really knows the purity of what you're purchasing. Mehandi.com and LUSH Cosmetics are two suppliers known for high quality. Henna is gentler on your hair than permanent hair color because it only deposits dye onto the surface, not inside the cortex. The effects from henna are most similar to semi-permanent hair color. Both are safe enough for fragile African American hair. Can I get the same color results using henna as with commercial hair dye? Maybe. Pure henna leaf powder can only produce a red to orange-red color. Different crops (depending on location) produce different levels of red, ranging from auburn to cherry. If you see henna advertised as producing black or brown shades that means the henna has been mixed with some other herb or product. For example, henna is commonly mixed with cocoa powder to produce reddish brown. Since henna is a depositing dye, it cannot lighten your hair...only bleach can do that. If your natural hair color is dark black, henna may not show up at all or it may produce a red shimmer. If your natural hair color is dark brown or lighter (including grey), you are likely to see a color change after your first henna application. The color should be subtle, but it will increase in intensity after every treatment. If your hair is bleached or relaxed, your hair is more porous. Porous hair absorbs chemicals more easily and the henna dye may absorb into the hair cortex instead of just coating the outer shaft. The color may still be subtle, but definitely noticeable in direct light. Will henna loosen natural African American coils? Sometimes. A quick Internet search produces thousands of results on the subject. The only thing we know for sure is that everybody's experience is different. If you want to loosen your natural coils, you can definitely experiment with henna. Any effect will be gradual. Most women who report looser curls say that it took 3 or more treatments to see any difference. However, if you truly wish to transform Type 4 coils to looser curls, a chemical treatment (applied by a professional cosmetologist) will deliver more significant and uniform results. How do I get the most out of my henna treatment? First, purchase your henna from a reputable supplier (see above). To get the most value for your money, choose pure henna with high dye content. Typically, 100 grams of pure henna only contains 2 or 3 grams of dye. The rest is just ground up henna leaves. So, for the most effective treatments, you definitely want the highest dye content available. Ask your supplier which henna they recommend to cover greys because that usually means maximum dye content. When working with pure henna, the liquid that you use to help the dye release can impact the treatment results. An acidic liquid will help the dye release faster. Aloe vera juice is a great choice because its pH is low enough to smooth your hair's cuticles without making your strands stiff or dry. Henna hair treatments have been done by North African and Indian women for decades with little to no instruction. Unless you're really hoping to achieve curl loosening or a color change, feel free to experiment by adding Ayurvedic herbs to your mix (supplier websites usually offer plenty of recipes). When attempting to change your curl pattern or hair color, keep it simple and just add an acidic liquid. A batch of high dye content henna can quickly become low dye content if you add too many oils and herbs to the mix. If this is all sounding like too much guess work, try one of the pre-mixed henna bars from LUSH. They combine henna, lemon juice, cocoa butter, and herbs into one firm block that you just have to melt in a bowl of water. The biggest advantage with henna is that you can do it yourself. Your henna supplier will give you all the instructions you need for a successful treatment. Whether your hair is natural or relaxed, a properly applied henna can add shine and softness to your hair. You can't count on any other benefits, but feel free to try it a few times and see what you get! I'm extremely interested in trying henna on my hair for its conditioning benefits. However, I am extremely concerned about the color effects, as I already have natural auburn colored hair and I do not want to end up with a weird color change. I wish there was more information on this regarding light-colored african-american hair. Thanks for the info. It helped answer quite a few of my questions I had regarding it! I tried henna for the first time this weekend. Love the color, and thinking about doing it again weekly for the next month. My problem is: it seems that residual henna is still "leaking" from my hair every time I style it. Any suggestions on how to counteract this? I've painted my nails, but my palms and fingertips have a decidedly orange tint to them. Finally, I just reread the post. Is aloe vera gel acidic enough that tea or lemon juice isn't necessary? I use henna mainly to cover the few gray strands around the right side of my hairline. I'm not an expert, but I use green tea in my henna mix. I recently tried a henna, amla mix and only added water because amla is acidic. I would love to know if anyone has successfully only added water to henna and got a similar result. I actually wrote a blog post yesterday with a video of how I apply henna to my entire head. I typically use henna and have amla from mehandi.com. I tried a new mix recently, however I'm going to stick to henna from sources that I know and trust. Has anyone found a quality henna other than the brands mentioned above? I just did my first henna treatment. Mostly for hair strengthening but I would have been happy with a colour change. Well, pitch black hair just got slightly darker and glossier, which is great. I love how my hair looks. I did a deep condition right after (admittedly for less time that i usually do it, but over an hour). Well my 2 issues are that my hair isn't as soft as it was before, and more importantly I've had crazy breakage since then. And now i'm conflicted, because i like how my hair looks, but i obviously can't keep doing something that causes my hair to be dry and break. Any suggestions? I mixed the henna with some vinegar, olive oil and conditioner. Yeah, people should realize that "natural" is not always better. I'd imagine that since no hair dye can alter your hair's structure, the loosening people see if from the weight of the henna itself. It a permanent process even if it does coat your hair too in that the color really does have to grow out (not obvious on dark haired people but you'd see if if you went to India where people use it to badly cover their gray). Permanent colors lift the cuticle and deposit color underneath. If your hair is dark and you want to go lighter, the your own pigment is lifted and then the new color is added. All of that does affect the strength and condition of each hair strand. And that might temporarily alter your structure but it doesn't break the disulfide bonds, which is what has to happen to permanently alter your hairs texture. The bonds can be affected by things like HIGH heat but they will reform although over time you can greatly weaken them. Hair is a protein, and denatured protein can reform its bonds unless the bond is attacked chemically. People need to stop believing everything that they read on the internet. A lot of "natural" things are toxic, harmful, poisonous, and can cause permanent changes to your body, so don't convince yourself that just b/c henna it is some kind of miracle treatment for your hair. If you have trouble with dryness, then just like anything else, it doesn't agree with you and it's not a matter of "doing anything wrong." Just like some people have beautiful hair with relaxers and some don't. We are all different. I did a two-step henna and indigo process this weekend. I LOVE the fact that I barely lost any hair in the shower or in my comb. I also like the shiny black color. The problem? What a mess! Make sure to lay old towels or newspapers everywhere in your bathroom and have a paper towel or sponge ready to get spills! Thanks for the tip. I will be sure to try it out next time i wash my hair. I've been wearing my hair in flat twists to make sure I don't touch it so it doesn't break. I use a mahogany henna and I do notice that it can make my hair hard S/P and hour or two after my hair drys. I like how the henna looks and I think that I will do a deep conditioner 2 days before the henna and see if that works. I do wash my hair and deep condition 48 hours after the henna, without fail, and I dont manipulate my hair after the henna treatment until after the deep conditioning. So I'm still learning. I have used henna twice and didn't really see any huge difference. My hair feels springier but I don't know if I have too much protein or not. Either way I'm going to do a clarifying wash just to be safe. My next step is to try a color with henna but I have NO idea what to pick. I want to either go reddish or black but I'm 27 and don't know which will make me look older since I'm trying to avoid this. @ learn2lovelife, I don't think a color will make you look older (unless its gray! lol) But I did read in a magazine to go for lighter colors to look "younger", but to each her own! As far as for me, I am not a big fan of henna. Sorry, I am one of those who like lighter colors (light browns). I also don't see much of a difference when I use it as far as texture and softness. Im just walking around with a deep red hair color and I don't like it....just will wait it out and its back to the chemical colors for me! I ordered samples from Mehandi and liked how finely milled they were! :-) I found the product line more expensive than "Light Mountain", so I haven't purchased it because I am so cheap. LOL! When I henna I use "Light Mountain - Cover the Gray" brand. It is a complete henna-indigo kit, containing packets of indigo and henna, gloves, instructions and a plastic cap. You may purchase it at health food stores. I will be honest - henna leaves my hair hecka-dry, and the indigo packet is truly messy. The indigo is not as finely milled as the henna packet. LIGHT MOUNTAIN RECOMMENDS USING WATER TO MIX their kit. It doesn't have to sit overnight - and can be used immediately after adding water. I have used Aussie and HEHH for my final rinse, but I recently realized 'CONES leave my 4b/c hair dry. Still looking for a slippery 'cone-free post-henna conditioner. @Stephanie 11:39 - thanks for the clarifying shampoo suggestion! I will try it next time (but with no 'cone conditioner)! I've been using Jamila henna for three months now (once a month) and I love it. I mix it with lemon juice, conditioner, and water. But now I'll just mix it with lemon juice and water. I would add HENNA SOOQ as an amazing shopping and information resource for REAL hair/body henna and which country varieties perform best for which results (i.e., Yemeni vs. Persian or Moroccan). Also for anyone with DRYNESS or BRITTLENESS after using henna, in my experience just like Rhassoul, it's essential to restore balance to my hair afterwards with an acidic rinse like ACV, lemon/lime, berries, banana or honey or Blue Malva herb. I love doing henna treatments. I can expertly do it with dripping everywhere lol. @ Stephanie 11:25 AM…Thank you so much for this information about clarifying shampoo and to mix baking soda. I have had my ends trimmed 3 times since I did the big chop in January 2010 but my ends are still very dry and unruly. I only use heat when I deep condition my hair each week (covered with conditioner and a plastic cap). I just did a deep treatment with indirect heat and my ends feel and look like a brillo pad. I noticed last week while applying a protein treatment that my hair in the front along the hair line has broken off. Last night I was so upset and frustrated that I was contemplating cutting my hair (doing a 2nd big chop) and starting all over. I do use henna and Rhassoul clay on my hair regularly so these may be the culprits. Again thanks for the information I will defiantly give clarifying shampoo and to mix baking soda a try. you all should try Godrej Nupur Henna Mehandi 9 Herbs Blend. i have read so many positive comments and posts about it! it is SURPRISINGLY cheap! a pack contains 150g and is only for $3.99!!!!!!! i can't wait for my order to come in! Godrej Nupur henna is a very nice henna blend but if you like JAMILA BAQ henna try this Ebay listing, they charge $7.50 for 100g box and NO SHIPPING fee. I have done a Jamila henna treatment probably a total of 4 times each time spaced out by about 2 months. Each time I did it I had major shedding that followed subsequently. My hair felt dry, had horrific texture and wasn't as spring/bouncy/curly as it normally is. I really want to like the henna treatment but I have come to the conclusion that it is just not for me and its time for me to move on. I have done three henna treatments in three months using the Jamila 2009 crop. Unfortunately I am experiencing severe breakage and thinning. The first application was beautiful. I did not think that applying henna every 4-5 weeks would be harmful to my hair. I followed the how to henna instructions to the letter. The breakage at the crown of my head is down to the scalp and continues to break daily. Is it too late to clarify? I have washed and deep conditioned several times. I do not have long hair to begin with, but at least it was healthy before the henna. I wanted to be a henna head now I have lots of product and no use for it. Here's a video on Henna its pretty short, but its helpful. I hate the henna bars from LUSH! They have coffee grounds in them and after a henna treatment it takes FOREVER to get all the grounds out! I've even picked grounds out after numerous washes weeks later! Such a pain! @CurlyNikki: only Caca Rouge has lemon juice in it the other henna bars don't. Are there any type 4 with TIGHT coils who have tried henna? I wanted to do a henna/indigo treatment to colour my hair but I don't desire any curl loosening (actually that would be a reason for me to avoid henna...). I have read that the curl loosening mostly happens for type 3 curls, can anyone give their experience with this? Just did my first henna from lush fingers are crossed.but what a mess! Henna gives hair natural colour and very useful for health hair.